Betty and Barney Hill's abduction by aliens in the early hours of 20 September 1961, is the most convincing case of its kind. 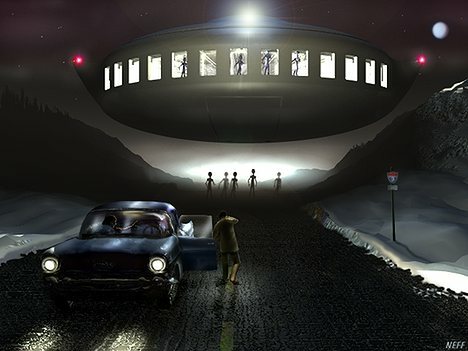 Their story of being medically examined onboard a flying saucer prefigured the ever-more traumatic and frequent visitations by the grey alien abductors from the 1970s onwards. Unlike the fantastic stories of the contactees of the 1950s, who had philosophical conversations with blond-haired Space Brothers as they went on unlikely trips to Venus and Mars, the Hills' reported an encounter that fitted the notion that extraterrestrials were conducting a systematic and scientific reconnaissance of our planet. Sighting of a UFO that followed their car as they were driving from <?xml:namespace prefix = st1 ns = "urn:schemas-microsoft-com:office:smarttags" />Niagara Falls to their home in Portsmouth, New Hampshire, on the night of 19 Sepptember 1961. Barney stopped the car and using binoculars saw figures inside the UFO. In a panic Barney drove away from the UFO. They heard a beeping sound. When they heard the same beeping sound again they were driving 35 miles south of the sighting location. They had no recollection of what happened to them between the two sets of beeping sounds. They got home at about 5am on the morning of 20 September 1961. Afterwards they experienced continued anxiety and ill-defined fears that made them seek answers to what really happened to them. Betty thought that if they had seen an extraterrestrial spacecraft then they could have been exposed to some form of radioactivity or cosmic rays. For this reason when Barney unloaded the car she insisted that he put their belongings on the back porch for a couple of days. They also felt very dirty and had long showers to get rid of this feeling. Indeed, the concern about what the craft might have done to their health was the main reason why she reported their sighting. The only official investigation into their UFO sighting on that fateful night was conducted by Major Paul W. Henderson who spoke to the Hill's by telephone a few hours after their encounter. It took Project Blue Book two years to produce a final report on their sighting. Dated 27 September. 1963, it claimed that there was insufficient evidence to determine what caused their sighting. It guesses that they probably saw Jupiter or it was caused by something similar. Only two days after the sighting Betty visited her local library to find out more about UFOs. On obtaining Major Donald Keyhoe's book The Flying Saucer Conspiracy, she read it in one sitting and wrote to him about their sighting on 26 September, 1961. The realization that they had been abducted came to them relatively slowly. The first indications came when Betty Hill had a series of nightmares running from 29 Sept to 3 October, 1961. She dreamt that alien men took them to a landed craft in the nearby woods and conducted medical examinations on them, before returning them to the car. These dreams outlined what they later recalled under hypnotic regression. Betty tended to think these dreams might have been memories of real events, but Barney just thought they were vivid dreams. A meeting that was to have a great deal of importance for the whole case occurred on 25 November, 1961, when two UFO investigators associated with NICAP (National Investigations Committee on Aerial Phenomenon), Robert Hohman and C.D. Jackson interviewed the Hill's for 12 hours. Also in attendance was Major James McDonald an Air Force Intelligence Officer based at Pease Air Force Base. Some UFOlogists have suggested some dark and sinister meanings to his presence, but he was an old friend of Barney's. Indeed, they socialized with many people who worked at the air base. During the meeting the investigators tried piecing together the journey and it was now that they discovered that the journey was two hours longer than expected. Betty claims that they already knew that they could not account for the whole of their journey and that this meeting merely confirmed that there was a period of missing time. The Hills spoke about the sighting of the humanoids but not about Betty's dreams. During the interview they are worried by the idea that they had hallucinated the whole experience, and for the first time Major McDonald says they might consider hypnosis to get to the root of the matter. Since he was unable to recommend any hypnotists this avenue of investigation was left alone for the time being. This version of events is undermined by John and Anne Spencer in their book Fifty Years of UFOs. They show that Fuller edited out the line 'We are considering the possibility of a competent psychiatrist who uses hypnotism' in Betty's original letter to Keyhoe. It seems that Fuller had done this to give the impression that hypnotism was a 'last resort' to finally pin down the details of the case. He probably did this to add some drama to the story and it does make you wonder what other details he changed for dramatic effect. When Spencer spoke to Fuller about the case in 1989, Fuller said that he had taped several two-hour long trance sessions with the Hills. It was his claim that no one could have a full understanding of the case without listening to these tapes, but he had no intention of publicly releasing these tapes. This does not sound like an healthy approach to investigating such a controversial case. It also reminds us that Fuller was first and foremost a journalist looking for stories, and that the Hill case was never fully investigated in any serious fashion throughout the 1960s and at best in a fragmentary manner in the following decades. In the months after the encounter Barney's health deteriorated but it was not until the first half of 1964 that Boston psychiatrist and neurologist Dr Benjamin Simon conducted the hypnotic regression sessions that were to fully reveal their abduction experience. They went down a back road that was blocked by 11 or 12 aliens who were approximately 5ft 4in. (1.6m) tall. These humanoids had no ears but had slit-like mouths, small noses, cat-like eyes that seemed to extend to the side of their heads, and broad foreheads that tapered down to a small chin. They were taken to a nearby landed UFO. Inside the UFO they were put into separate rooms where they were stripped and put on examination tables. The aliens inserted a long needle into Betty's naval, she's told it is a pregnancy test. A cup-like instrument was placed over Barney's groin. Later, he had a ring of warts where this was placed. Some UFOlogists claim that the aliens used this device to obtain sperm samples from Barney. Betty always denied this. Betty spoke to one of the aliens. He showed her a Star Map. She tried taking away a book full of strange writing, but she was not allowed to take it away. When Betty is returned to their car she sees Barney sitting inside it, in a kind of daze. Although they were hypnotized separately they certainly had time to discuss what had happened to them between themselves, and with other UFOfologists in the two year period between the experience and the regression session. From very early on Betty understandably read as much as she could about the subject that influenced and shaped what she 'recalled' as a real abduction experience. Betty's sister had also seen a UFO in 1957 so they were not entirely UFO 'virgins'. There has been considerable speculation about the stresses the Hills were under at the time. They were an inter-racial couple at a time when such relationships were frowned upon. Barney worried about his children from a previous marriage, and his job as a postal worker involved a considerable amount of commuting. Betty was a social worker and both of them were actively involved in civil rights campaigns. They had gone on their fateful trip on a whim without taking much money with them, and they were heading home at night to avoid bad weather. At this stage we could just dismiss their abduction recollections as a fantasy that was triggered by Jupiter or any other kind of light in the sky. Yet, there are several other supporting pieces of evidence that we have to consider. Betty Hill claims that at 2.14am on the 20 September, 1961, Pease Air Force Base picked up a UFO on radar and that they sent out two aircraft to investigate it. What the pilots saw, according to Betty, has remained classified ever since. During a casual conversation on 22 September, 1961 between Major Gardiner B. Reynolds, 100th B S DC01and Captain Robert O. Daughaday, Commander 1917-2 AACS DIT, Pease AFB, N.H., it was revealed that a strange incident occurred at 0214 local on 20 September. No importance was attached to the incident at the time. We have to ask what they mean by a 'slight incident'? Was it just a strange blip on the screen or something more substantial? From the casual way this is reported it does not sound like it was something that would cause them to scramble a couple of aircraft. Even if something was seen or tracked on radar it does not mean they tracked the same object that the Hills' said they saw. After their encounter they found six, strange, shiny spots the size of a dollar on the car's trunk. Betty thought they might have been radioactive so she ran a compass over them. The compass needle moved erratically when Betty did this test, but when Barney tried it the needle acted normally. Whether these spots were radioactive or not it was presumed that they were caused when they heard the strange beeping sounds, which seemed to come from the trunk of their car. A more mundane explanation is given by Karl Pflock who notes that when the Hill's got home they found the lid of the trunk was not closed properly. This could have happened just before Barney's first close encounter with the UFO when he took a hand gun out of the car's trunk. In his panic stricken state he could easily have left the lid unlatched, thereby causing the strange sounds when the car roared away. Following the encounter the top of Barney's toe caps were found to be scuffed. This would substantiate his statement that he was dragged by his arms towards the landed UFO when he was abducted. The dress Betty wore during the abduction was found to be covered in a pink powder. When this was shaken off it left pink stains behind. She also found the hem and seams torn. The patterned, purple dress has been kept in her closet and over the years she cut sections off it to satisfy the requests of laboratories throughout the world. So far no one has provided any evidence that it is of exceptional, let alone extraterrestrial origin. Even weirder Betty claimed that six to eight weeks after their encounter they returned home to find a pile of leaves on their kitchen table. They had just been back to the mountains searching for the location of their encounter to see if it triggered any memories. When cleaning up the mess she found the blue ear rings she had been wearing the night of the encounter. She quite reasonably wondered how she lost them and how they got in their home. What this indicated to her was that the aliens had stolen her ear rings and they knew where they lived. The most powerful piece of evidence to support their claims was the notorious Star Map. Working in conjunction with Betty, amateur astronomer Marjorie Fish created a three-dimensional map of the star system that matched the Star Chart seen onboard the flying saucer. This seemed to indicate that the aliens originated from the double star system of Zeta Reticuli. Sceptics have convincingly argued that Betty's Star Map consists of vague dots and lines that could be matched with an whole range of stellar systems. At a more basic level would the pilots of a highly sophisticated spaceship carry such a useless Star Map? The bottom line is that the main evidence for this abduction comes from the testimony of the Hills that comes from a combination of nightmares and accounts given under hypnotic regression. They came across as sincere and truthful people to everyone who interviewed and met them. Though this was undermined by Betty's many subsequent claims of psychic events, and sightings of hundreds of UFOs many of which could be easily explained. There are also several inconsistencies in their abduction story. They showed extreme anxiety when recounting the incident, yet Betty said to the 'leader' alien as she was leaving the spaceship: 'This is the most wonderful experience of my life. I hope you'll come back. I got a lot of friends who would love to meet you.' Other inconsistencies occur in the description of the aliens. Betty at first described them as having Jimmy Durante noses but this was dropped in later recollections. Barney said they communicated via some form of telepathy whilst Betty's aliens spoke to her in English. The aliens also seemed to have selected areas of knowledge and ignorance. For example, they were puzzled by Barney's false teeth yet had an otherwise good knowledge of human anatomy. There are several fantasy or folkloric elements to the encounter. Like visitors to the fairy otherworld Betty is not allowed to take away a souvenir as physical proof of her experience. And, the Kalendrier des Bergiers, a fifteenth century French calendar shows demons torturing people by inserting long needles into their stomachs. Barney was intensely aware of his racial background and it is significant that he thought he saw an evil Nazi alien looking at him when he originally viewed the UFO through binoculars. On these slim grounds this has led some to speculate that this proved their encounter was with a craft built under an alliance of the CIA, Nazis and the aliens. Martin Kottmeyer and Peter Rogerson in their many contributions to Magonia magazine have looked in detail at how science fiction films and television, UFO literature and beliefs, combined with the Hills' own psychological stresses and the 'mood' of the time (fears generated by the Cold War, atomic doom, civil unrest, the Space Race) all helped shape the Hill abduction experience. To other UFOlogists such explanations are even more fanciful than the explanation that they met aliens from outer space or from another dimension. Whatever the theories and controversy, the Hill case has made a permanent impact on the way we perceive alien abductions today. One of the most renowned incidences of alleged alien abduction occurred on September 19, 1961on US Route 3 near the village of Lancaster. Barney and Betty Hill of Portsmouth, New Hampshire were traveling home after a vacation in Canada when they saw a moving light in the sky. Every now and then they would stop and check on the unusual light that seemed to "fly" an erratic course. They drove on towards the White Mountains, noting that the object as now much larger and following a parallel course to their car. Approaching Indian Head, the light appeared directly ahead of them. Barney Hill left the engine running and got out of the car to observe the strange object with a pair of binoculars. He observed what he described as "5 to 11 figures moving behind a double row of windows". Betty Hill, who was observing her husband from her side of the car, heard her husband repeating, "I don't believe it! I don't believe it! This is ridiculous!" She, however, was unable to see the figures or the descent of the UFO. The object was now approximately 70-feet overhead and about 100-feet distant when Barney Hill ran back to the car exclaiming, "They are going to capture us!” He got back in the car and drove away at a 'break-neck' speed. During this time Betty Hill was still unable to see the object but her husband thought that it was directly over the car. They heard a loud beeping noise, similar to the sound of a "tuning fork", and then they felt very drowsy. When they awoke, they found themselves driving near Ashland, two hours later. Ashland is 35- miles south of Indian Head, a twenty thirty minute drive. They continued their drive home, feeling somewhat uneasy and confused about their missing two hours. The next day they reported their experience to officials at Pease Air Force Base. A few days later, an investigator from the National Investigations Committee on Aerial Phenomena (NICAP) documented both of their stories. Their experience was far from over. Within ten days of the incident, Betty Hill began having recurring nightmares in which 8 to 11 "men" would stand in the middle of the road and stop the Hills' car. They would then be led into a disk-shaped craft and examined. Samples of hair and skin would be taken. Continued anxiety led both of the Hill to seek the help of Dr. Benjamin Simon, a Boston psychiatrist who specialized in treating personality disorders and amnesia through hypnotherapy. Their treatment lasted for six months. With time regression hypnosis, many details of their encounter were revealed. The detail in which both Hills described their abductors and the subsequent examination matched closely to each other as well as to Betty Hill's nightmares. Betty Hill, under posthypnotic suggestion, was able to draw a "star map" detailing the origin of the alien abductors. The amazing configuration of Betty's map was not to be realized for some years. An astronomical investigation, based on information that was not available in 1961, produced a controversial match between Betty's "star map" and a cluster of previously unknown stars near two stars called Zeta Reticuli. With the object hovering about 50 feet away, Barney stopped the car, south of Indian Head, and had a look for himself. He described the craft as a large, glowing pancake. Looking closer, Barney thought the ship must have been some type of secret military craft, and commented "How interesting, there is the military pilot, and he is looking at me!" He saw there were others looking at him through other windows, and became terrified that they might try to kill him and his wife for seeing what he considered a top secret military aircraft. Barney and Betty both got back in the car and raced like a bat out of hell to get away from the thing. As they drove they heard a strange beeping noise coming from the trunk, which seemed to make them feel drowsy. After the beeping started a second time, they became fully alert and found themselves a few miles south of where they had seen the object. Unable to recall exactly what they had experienced. the two continued home feeling a bit befuddled. Expecting to be home by before 3:00 A.M. the Hills were shocked to find that it was 5:30 A.M. when they arrived. Betty called her sister the next day, who heightened Betty's fear by suggesting some type of radiation may have been involved. Wrongly suggesting that a compass could detect radiation, Betty went to the car and discovered " a dozen or more shiny circles scattered on the surface of the trunk, each perfectly circular and about the size of a silver dollar." The compass did not move when placed on other areas of the car, but began to spin wildly when placed on one of the shiny spots. Convinced that something odd had indeed happened to them, the Hills filed a report of the UFO with Pease Air Force Base in Portsmouth, just 36 hours after the incident. In recent years the Hills story gained some more substantiation when it was learned that, according to Report No. 100 - 1 - 61 of the SAC 100th Bomb Wing, Pease radar had registered an "unknown" at exactly the same time the Hills had their run in with the UFO. I was impressed that the Hills underplayed the dramatic aspects of the case. They were not trying to sensationalize. They did not seek publicity. It was through Webb that the Hills realized that they had lost more than two hours during their trip. Something more than just a UFO encounter must have occurred to explain the "missing time". Soon after the encounter, both Hills began experiencing physical and psychological effects from the experience. Betty had nightmares in which she found herself being taken aboard the UFO and examined by small, humanoid beings. Barney began to suffer from high blood pressure, ulcers, exhaustion, and a strange circle of warts around his groin area. Both underwent extensive medical examinations by specialists in 1962 and eventually were referred to Dr. Benjamin Simon, a respected psychiatrist and neurologist with an extensive background in hypnosis therapy. Betty said a long needle was inserted into her stomach as part of a "pregnancy test" while Barney said a circular device was painfully attached to his groin. Following Betty's examination she was given a brief tour of the craft, and when she asked where the aliens were from she was shown a star map. After being told that they would not be able to remember their abduction, the pair were released back to their car, and the UFO, appearing like a huge, bright orange ball, flew away. Even though the Hills encounter was circulated among their friends and a couple of UFO publications, the story was generally unknown to the public until 1966, when Look magazine published a two part excerpt of a book by John G. Fuller entitled The Interupted Journey. Fuller’s book soon became a national best seller, and the story became even more popular when, in 1975 NBC-TV made a move called The UFO Incident, starring James Earl Jones as Barney Hill and Estelle Parsons as Betty. Barney Hill died of a cerebral hemorrhage in 1969, while Betty went on and became a celebrity in the UFO community. First let it be said that I do not and can not doubt the veracity of the Hill's account, and I believe in the factual reality of their experience. Anyone who has spoken with them has heard the recordings while they were hypnotized, and has examined the evidence, cannot doubt that what they described did in actuality happen. While for certain there are those who have doubts about the Hills story, from accusing them of outright fabrication to recalling dreams while under hypnosis, there is no denying certain facts about the case. Pease Air Force Base did pick up an unidentified flying object at the exact time and location that the Hills claimed. There was also the circular, magnetically charged marks on the trunk of the car. Also, while the Hills were hypnotized separately, their stories remained consistent down to the smallest of details. Betty’s description of a needle being inserted into her belly was unheard of at that time, but is now commonly used in to remove a woman’s eggs for in-vitro fertilization.